Nothing boosts your confidence on a night out like a sharp outfit that’s perfectly suited to your plans. The ideal wardrobe turns heads without screaming for attention and keeps you comfortable as the night wears on—and possibly takes a few unpredictably wild turns. Our trick to achieving Friday night style nirvana? A black shirt or jacket. It’s an obvious choice, sure, but nothing establishes an outfit as evening appropriate and dead cool like this move will. Start there and everything else will fall into place, we promise. Here, six stylish examples for every type of night out. See you on the dark side. When you don’t have time to change your clothes after work, this simple switch-up can be made in your office bathroom if need be. Wear your favorite navy suit to work with all the polished professional fixings, then pare things down before you hit the town. Swap your shirt and tie out for a slim black polo, throw a little pomade in your hair, and you’re good to go. You don’t even have to change your shoes (just no goofy socks, please). 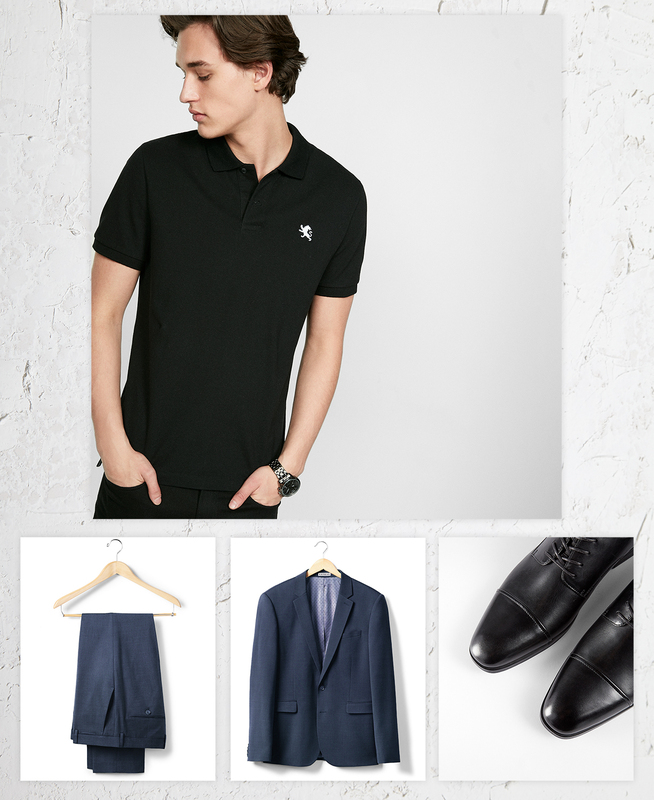 When you not only have time to go home after work, but you also have time for a shower, shave, and pre-party drink at home, spend some time making your outfit a little slicker and more serious. 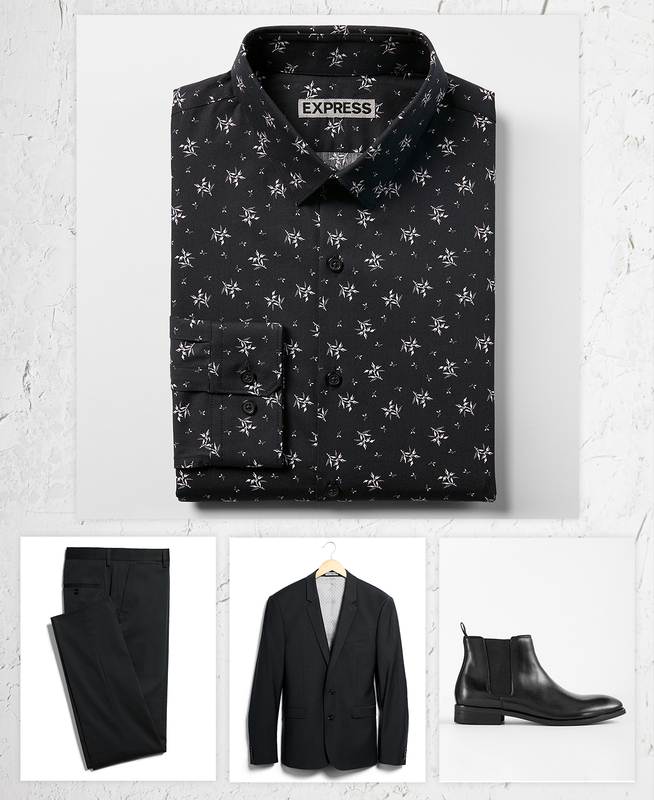 We love a dark floral dress shirt worn under a slim black suit for pretty much any nighttime endeavor, from club nights to fancy prix fixe dinners. Finish the look with British-Invasion boots for the right kind of rock ‘n’ roll touch. 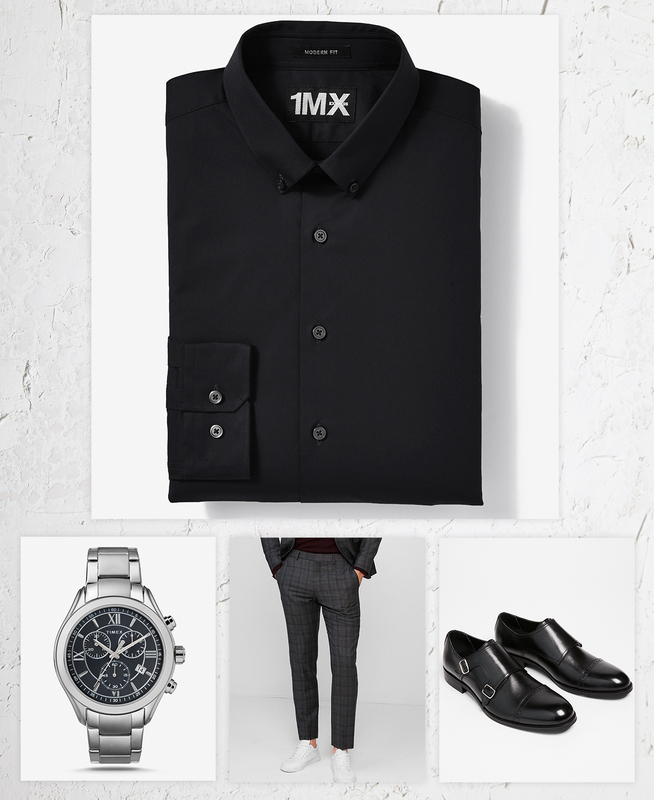 A simple black dress shirt is mysterious and minimalist, which is exactly what you want for a first date. The trick is styling it so no one mistakes you for a waiter. Think: plaid dress pants instead of matching black chinos, paired with Italian-guy monk strap dress shoes instead of simple lace-ups. If you want to add a little bling, by all means go for it. A nice dress watch keeps the top half of your look as interesting at the bottom half. When you’re dining or drinking in someone’s home, you want a after-hours fit that’s cool but also comfortable too. A casual shirt in an artful black print hits just the right note; bonus points if you’ve got some forearm ink or eyewear to add to the mix too. 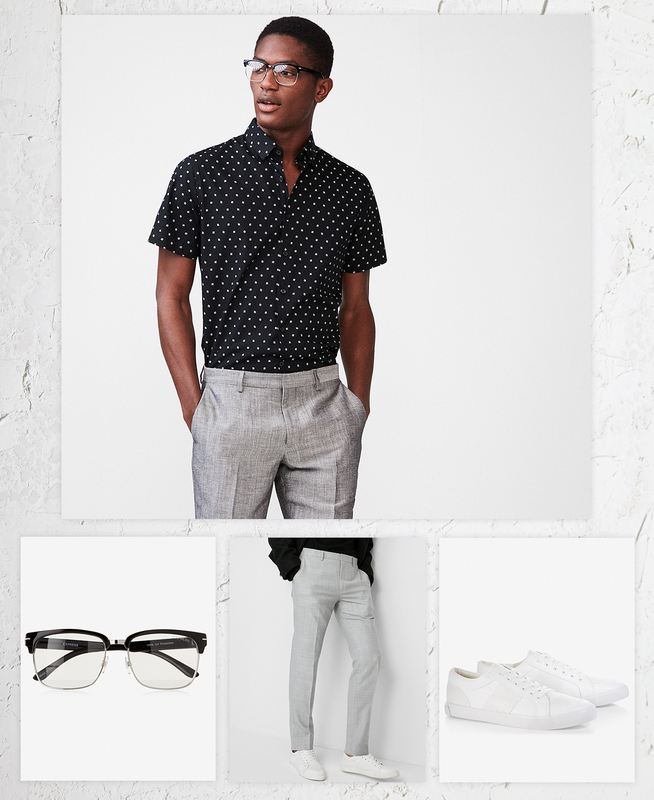 Finish the look with slim gray trousers and white sneakers to keep things polished but not too stuffy for a night of lounging, laughing, and eating way too much. When you know the night will start with a beer but have no idea what will happen from there, it’s head-to-toe black FTW. We’re keen on Western style shirts right now, and one in black is pretty much as cool as it gets—not to mention a nice way to distance yourself from all the bros in flannels and hoodies. 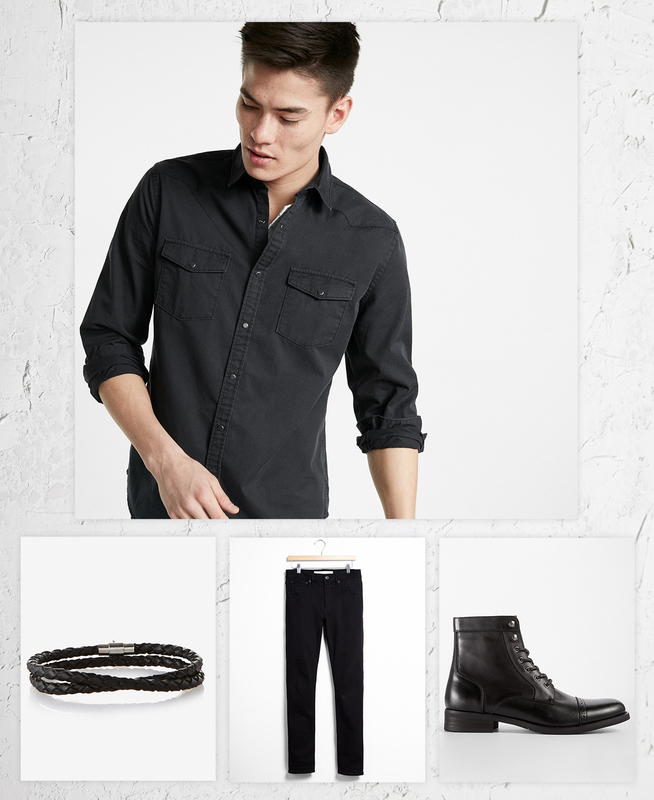 Add your favorite black skinny jeans and boots and you’re ready for whatever the night throws your way. Just spend a little Q.T. getting your grooming game just right before you leave the house. A monochromatic look like this has a way of putting your skin and hair on display. In 2018, joggers officially count as night-out style. If you’re a young guy heading to a movie and, say, burgers and milkshakes, there’s really no other choice. Just don’t forget your trustye secret weapon: the black jacket. 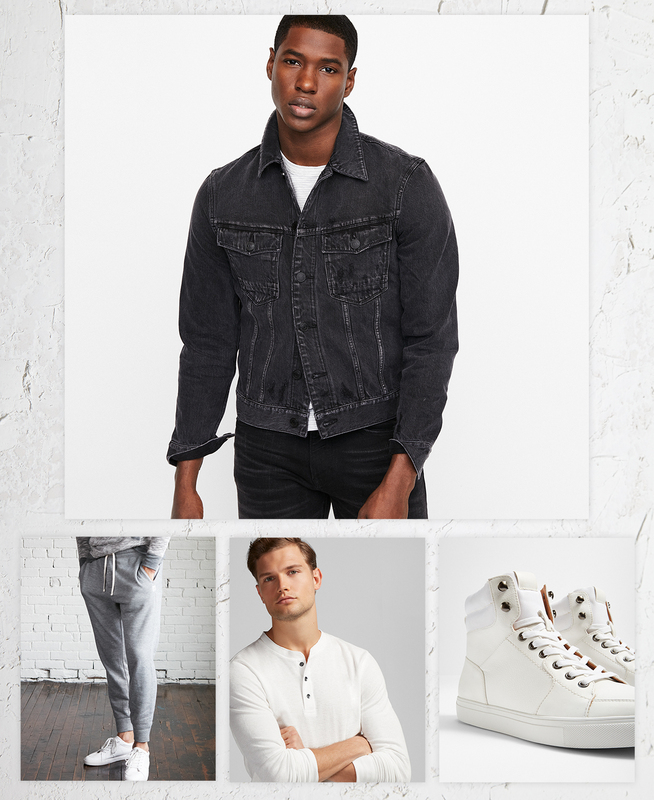 We dig the idea of a black denim jacket paired with sweats and sneakers for a look that doesn’t simply read as gym gear. Flip the collar up and add some good cologne or a chain necklace and you’re practically dressed up—by today’s standards, that is.